As a common instance, blue eyes are presented in only a few dog breeds. So, what dogs can have blue eyes? The most typical and well-known dog breeds with blue eyes are the Siberian Husky and Australian Shepherd. 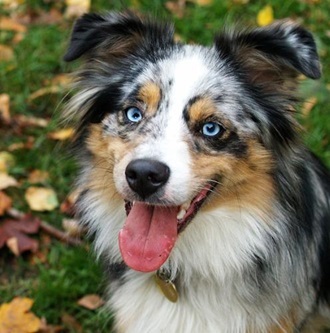 In these two breeds, the blue eye gene is independent of coat colour, which means any Husky or Australian Shepherd can have blue eyes regardless of its coat colour. In some cases the blue eye gene is associated with the coat colour being entirely or partly white. Extreme white spotting or white colour prevailing on the head, especially with a lack of colour around the eyes, can also result into a dog having blue eyes. If the white head markings are assymetrical, a dog may have a blue eye on the side of the head with the most white, and a brown eye on the colored side of the head. Dog breeds that are likely to have blue eyes because they are extremely white spotted are Dalmatians, Collies, Shetland Sheepdogs, harlequin Great Danes, dapple coloured Dachshunds and Australian Cattle Dogs ("Blue Heelers"). Note that many of these dogs are blue eyed because of the dominant merle coat colour gene, which may be connected to deafness. The blue-eyed factor in Siberians is NOT connected with deafness, unlike some of the other breeds in which blue eyes may occur. Deaf Siberians are very, very rare. The Merle gene is actually a semi-lethal dominant: dogs with one dose of Merle show the effects of the gene - scattered patches of missing pigment - including on the iris of the eye. They will also show a structural defect of the iris called 'iris coloboma'. Dogs with two doses of the merle gene are frequently deaf and seem to have otherwise reduced vigor. It is important to add that the blue eye colouring is a recessive gene existing in almost all breeds. In other words, any dog can have blue eyes regardless of its breed and coat colour. A puppy can be born with blue eyes even though its parents do not have it. This is a rare instance though. Moreover, in some breeds blue eyes are considered a disqualifying fault (for example, in Alaskan Malamutes). Some dog breeds such as Weimaraners have blue eyes as puppies. As they grow up, the eye colour change.